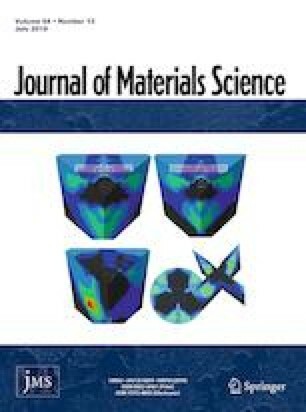 A series traditional thermoelectric films, including n-type Bi, Bi2Te3, and p-type Sb, Sb2Te3, were synthesized with CH3NH3I by combining magnetron sputtering and thermal evaporation method. It is found that the Seebeck coefficients for all the composite films have enhanced although the electrical conductivities reduced due to the decreased carrier concentration. This leads to an obvious improvement of the power factor, especially for p-type Sb2Te3-based organic–inorganic hybrid films. As expected, a maximum power factor value around 2.3 mWm−1K−2 has been achieved for the composition of Sb2Te3/CH3NH3I in range of the whole measured temperature, which is nearly seven times higher than that of pristine Sb2Te3 film. By combination with the reduced thermal conductivity, a ZT value nearly 1.0 has been obtained at 380 K for the composition of Sb2Te3/CH3NH3I. The online version of this article ( https://doi.org/10.1007/s10853-019-03596-4) contains supplementary material, which is available to authorized users. We acknowledge the support from National Nature Science Foundation (Grant No. 51302140 and 11604212), Natural Science Foundation of Guangdong Province (No. 2018A030313574), and Shenzhen Science and Technology Plan Project (JCYJ20160422102622085 and JCYJ20160307113206388), as well as Shenzhen Key Lab Fund (ZDSYS 20170228105421966).